Back to the Future Part II predicted many things about present-day technology, from hoverboards to holographic movie trailers. But the film’s writers and producers never could have imagined how excited fans are for October 21, 2015. That’s the date Marty McFly travels to in the 1989 film, and it’s also today—which is to say: Yes, you’ve made it. It’s the future. Congrats. Here’s a roundup of how companies and marketers are celebrating the big day. 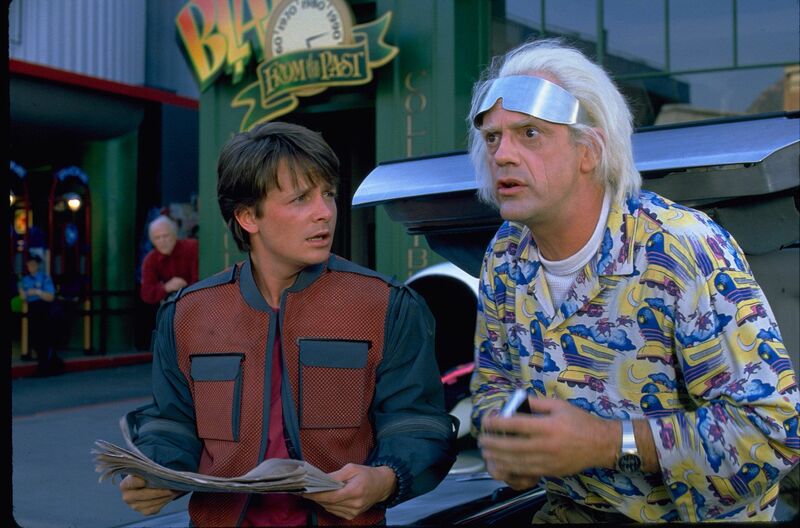 Back to the Future Part II made a lot of outlandish predictions about what life would be like in 2015. The most outlandish of them has the best chance of coming true: The Chicago Cubs have a shot at winning their first World Series since 1908. For all the ways the film fell short in its vision of the future, if the Cubbies do pull it off this year, everything will be absolved, and screenwriter Bob Gale—or whoever came up with the Cubs prediction—should probably be brought in for questioning. Now if only we could find someone to predict when the Mets will finally win another series. The single coolest piece of Marty McFly–related merch being sold this week isBack to the Future: The Ultimate Visual History, which HarperCollins released Wednesday. The book includes concept sketches, storyboards and collectible inserts such as a Hill Valley High tardy slip. It’s all licensed and authorized, which allowed HarperCollins to lock down exclusive interviews with the cast and crew, including executive producer Steven Spielberg. The book even features a foreword, preface, introduction and afterword by Michael J. Fox, Christopher Lloyd, screenwriter Bob Gale and director Robert Zemekis. We can only assume Tom Wilson wasn’t available to write an epilogue because he was busy doing the voice-over for Biff’s character in thenew remastered edition of the Back to the Future video game. If your Back to the Future fandom runs deeper than simply observing a moment of silence before watching the film for the umpteenth time, there is the We’re Going Back fest, a Back to the Future–themed Comic-Con taking place in Los Angeles from October 21 to 25. Take a look at the full rundown on the fest’s website. Among other things, the event will feature a recreation of the “Enchantment Under the Sea” dance in the original location it was filmed. The Flux Capacitors will be there and everything. Slip on your auto-lacing shoes and get down. Less devoted fans, make like a tree and get out of here. It’s one of the most memorable scenes of Back to the Future Part II: Marty McFly nabs a young girl’s hoverboard in order to escape from Biff and his gang of futuristic toughs. We see the hoverboard’s pink-and-green logo for only a second, but it was rad enough for Universal Pictures Home Entertainment to create a commercial for it in the days leading up to Back to the Future Day. The ad features a longhaired skater in power laces waxing poetic about the “first skateboard that’s always catching air.” Unfortunately, the hoverboard isn’t real. Can someone please make this happen already? Perhaps one of the coolest ways to, ahem, go back to the future is through sound. Enter Film Concerts Live, the company behind live symphonic performances of E.T. and Star Trek, among other cult classics. This fall, the company is also bringing Back to the Future Part II to present-day silver screens. The movie is hitting select theaters worldwide, and will be accompanied by a symphony orchestra performing the film’s score in real time. Crafted by composer Alan Silvestri, it will feature 20 minutes of new sounds. Catch a screening if you’re in Indianapolis (10/21); St. Louis (10/30-11/01); Melbourne, Australia (11/07); Perth, Australia (11/13); Denver (11/14); Dublin (11/15); Mexico City (11/22); or Cleveland (12/10). In 2016, shows take place in Chicago (03/04); Jacksonville (03/12); Portland (05/07); and Sydney, Australia (10/07-08). Ever wanted to see where Doc and Marty built the DeLorean time machine? Now you can. In honor of Back to the Future Day, a location tour in Los Angeles is taking fans back to where it all started. The tours, which start next Wednesday and go through the weekend, come in different tiers, depending on how much you want to pay. Those looking for the “complete experience,” can participate in costume contests, check out a “secret location” in Burbank that’s being transformed into the town of Hill Valley and gaze at some of the film’s original props. For $200, you can also can attend “keynote” speeches by the cast and crew, and head to a screening of the first film at Twin Pines Mall, where Doc Brown and Marty both visit when they’re traveling through time. If you ever wondered how Marty McFly started hanging out with Doc Brown or what Doc really does for a living, you might enjoy Back to the Future, the comic book. Published by IDW and announced back in July, the comics don’t invent new stories as much as examine the action the movies leave out. And since Gale was involved in the comic’s creation, it’s practically canon. But this isn’t the first time someone has tried to create a Back to the Future comic. From 1991 to 1993, Harvey Comics released its own comics as a tie-in to Back to the Future: The Animated Series. Let’s hope the new comics are slightly more memorable. It may sound gimmicky, but it’s part of a good cause. The Fairfax County Board of Supervisors has decided to rename the town of Reston, Virginia, “Hill Valley” from October 21 to 25. Home of the non-profit Washington West International Film Festival, Reston will host a red carpet screening of the first Back to the Future film on Sunday, attended by Gale, Lloyd, Claudia Wells (who played Jennifer in Part I, before she was inexplicably replaced by Elisabeth Shue) and James Tolkan (Principal Strickland). The proceeds from the screening, called #GiveBackToTheFuture, will go to the Michael J. Fox Foundation for Parkinson’s research. Pepsi landed some nifty product placement in both Back to the Future and its 1989 sequel. In the latter film, Marty arrives in 2015 to discover that the soft drink of the day is “Pepsi Perfect,” which apparently contains vitamins to make the soda healthy (disclaimer: It’s not). Pepsi has been planning for this holiday for a long time, as its marketing director told The Wall Street Journal. So if you’ve been waiting 26 years to pay $20.15 for a limited edition bottle of “Pepsi Perfect,” well, now you can. The company created 6,500 limited-edition bottles, and they’re on sale on Wednesday. One thing Back to the Future Part II got right about 2015: endless movie sequels. In a particularly memorable gag, Marty McFly is freaked out by a hologram advertisement for Jaws 19. Back to the Future Part II was released only a few years after Jaws: The Revenge (1987) Thankfully, we’ve been spared a fifth, sixth, seventh, eighth and so on entry in the shark franchise. Now, though, we have a Jaws 19 trailer to celebrate the occasion, with Steven Spielberg’s son Max listed as director of the (obviously not real) movie.